With 80 members and celebrating our 45th anniversary in 2015, the Rotary Club of Hiroshima West is one of the most active clubs in Hiroshima area. Not only in the local community but also in the international area, we are continuously looking for the service opportunity. The club established a sister-club relationship with Tainan Rotary Club in 1993. Also we have developed a close friendship with the Rotary Club of Chicago (Rotary One) since 2000. Rotary founder and the honorable president of RI, Paul P. Harris and his wife Jean stopped by Japan on February 9, 1935 on their way to Manila where the 5th Pacific Regional Conference of RI would take place.Paul frequently made trips to foreign countries in those days, and he planted twenty eight “Laurels of Friendship” where he visited. The laurel at the Tokyo Imperial Hotel was one of them.In 1968, the laurel was transplanted when the hotel was renovated. Unfortunately the laurel was in bad shape after transplanted. Hundreds of branches were cut off and they were replanted all over Japan. Among these second generations, only eight of them survived while the rest were dead. 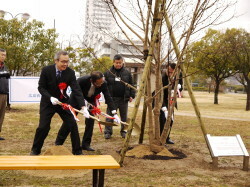 The survived trees were moved to the Yoneyama Memorial Hall in Mishima city, Shizuoka prefecture. The trees are still alive in good shape.The very original laurel was dead after moving. Two wooden hammers were made from the trunk of the tree. One has been stored at the Tokyo RC. The other was given to RI International Headquarters.The RC of Hiroshima West received a laurel, one of the third generation, from the Yoneyama Memerial Hall and planted it at the Hiroshima ANA Hotel on November 20, 1997 to commemorate the 50th anniversary of Paul’s death. The laurel is the only one descendant of the Laurels of Friendship in the district 2710, and holding the precious tree here is something we are really proud of. The club celebrated the 45th anniversary in 2015, and the 110th anniversary of our friend, the Rotary Club of Chicago. Both clubs were participated in commemorative events together. 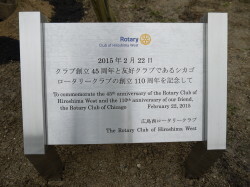 Our club planted a tree here in Hiroshima, and the Rotary Club of Chicago planted a tree in Chicago to cerebrate the great accomplishment each other. 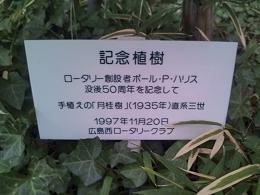 The photo is the magnolia tree we planted with the commemorative plate in Hiroshima. Copyright © The Rotary Club Of Hiroshima West. All Rights Reserved.